MDPE, otherwise known as Medium Density Polyethylene, is a light, durable and flexible piping system which is easy to install. 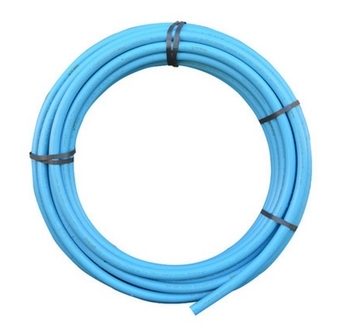 Blue MDPE which is generally used for underground installations, is ideal for carrying water including drinking water. Our MDPE pipe comes from FloPlast, and we offer a range of lengths and widths. Manufactured to BS EN 12201 – 2 : 2011. Available in 20mm, 25mm, 32mm & 50mm widths. Available in coils of 25m, 50m & 100m. Simple and quick to connect. To fit the pipe you don’t need to dismantle the connector. You don’t need to chamfer the pipe, you won’t lose any pieces on the job site. No time wasted; just cut the pipe, insert pipe liner, lubricate the seal, undo the nut a few turns, push the pipe in as far as it will go, tighten the nut and it’s done! 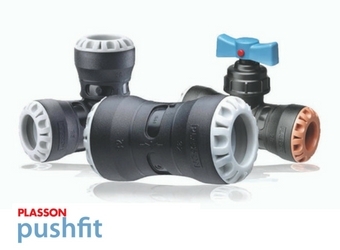 Plasson has one of the widest ranges of pipe fittings in the world meaning our branches can offer you a range of different fittings to suit your project. Tried & Tested: Been in continuous use for over 50 years. 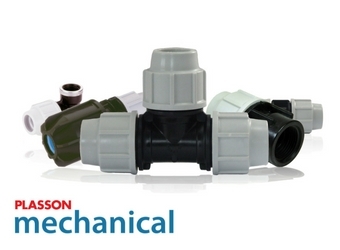 Reliability: Millions of Plasson fittings are providing safe and reliable connectons to water mains throughout the world. Simple to use: The Captive 'O' ring seal provides lifetime protection against leakage and requires no nut tightening to acheive a seal. Compatibility: designed to connect to many pipe types and materials providing compatibility with existing systems. Robust: Made from virgin Polypropylene for immense impact, strength and stress resistance. Range: Huge range of types, sizes and patterns of fitting with many unique solutions. Best in Class: Approved by major European & global agencies for use. Click here for fitting instructions. Provides dedicated solutions for connecting PE pipe to various other pipe materials, such as copper, polybutylene and PEX. WRAS approved and designed to withstand 16 bar pressure rating. Inserting the pipe up to the fitting stop creates both the seal and the grip on the pipe. Compact and attractive design makes this fitting ideal for Plumbing, where space is limited and appearance is crucial. Simplicity of the assembly makes both the professional nd occasional user's job easier.